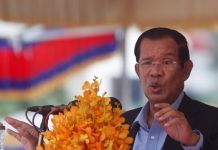 The chief of Prime Minister Hun Sen’s bodyguard unit said Thursday he would sue anyone involved in slandering him and sullying his reputation by alleging that he ordered the 1997 grenade attack against an opposition rally that left at least 13 dead and around 150 injured. A Ministry of Defense statement dated Wednesday said that information about a possible defamation suit had been sent to both civilian and military courts. “Would you accept false accusations?” Hing Bun Heang, commander of the premier’s bodyguards, asked when contacted by telephone Thursday. “I will sue the newspaper that accused me of hiring someone to throw grenades. I have suffered a lot because of these false accusations,” he said. Hing Bun Heang also said that he had many soldiers under his command and wouldn’t have needed to recruit others if he had wanted to attack the opposition rally. “Why would I need to hire somebody else?” he asked. The opposition Moneaseka Khmer newspaper recently published a transcript of a DVD anonymously released to media outlets in June that allegedly shows one of the men involved in the grenade attack confessing that he was recruited by Hing Bun Heang. Transcripts have also been posted in both English and Khmer on the controversial www.khmerintelligence.org. 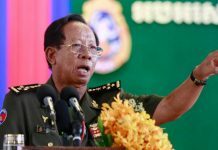 Dam Sith, editor in chief of Moneaseka Khmer, asked Thursday why the defense ministry had become involved in the issue and suggested the courts were perhaps being used to intimidate his newspaper. “The Ministry of National Defense’s information bureau confirms that HE General Hing Bun Heang will send the article distorting the facts to the Military Court and Phnom Penh court to investigate, find justice and take legal action,” the Defense Ministry statement read. 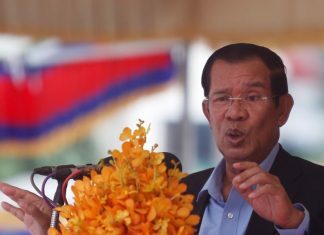 Government spokesman Khieu Kanharith said that the information about the possible lawsuit had been referred to both civil and military courts because although defamation is a civil issue, Hing Bun Heang is a military official and the grenade attack is potentially a military matter. But he said the final decision was up to the courts. He also said that Hing Bun Heang and his family have suffered greatly because of allegations of his involvement in the atrocity. “He knew nothing about this attack,” he said of Hing Bun Heang.